To create a application launcher and add that launcher to Unity in Ubuntu 13.04 / Ubuntu 12.10 / 12.04, is easy with gnome panel package. Using gnome panel, you can create a application launcher on the desktop or wherever you like to create in Ubuntu 12.10 / 12.04 / 11.10 / 13.04, then you can add that to unity launcher. Run the following command in the terminal(ctrl+alt+t) and issue the password for the user when prompted. After installing the gnome panel, use the below command to create a launcher in Applications directory under “/usr/share/”. Once you execute the above command, create launcher application will be opened. Check the screen shot below. 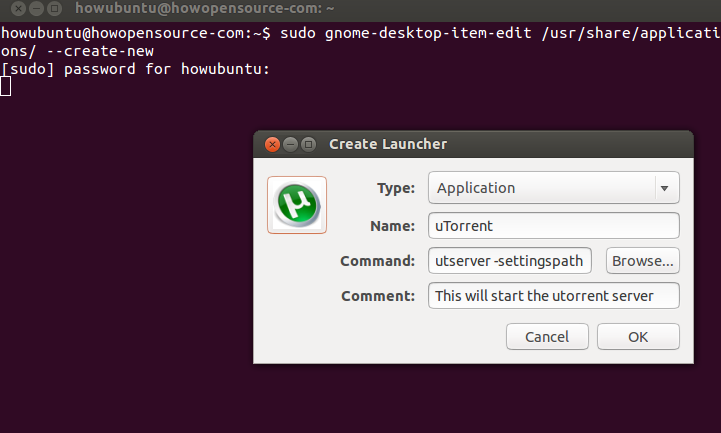 Here I am creating launcher for uTorrent, the same way you can create launcher for any application. In Type field Application will be a default value, if not select Application from drop-down menu. If your creating launcher for application which has no gui, that which runs in terminal like VIM editor then you need to select Application in Terminal. 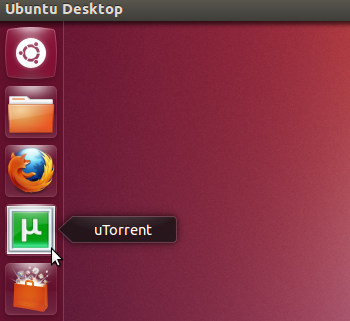 In Name field type the Application name, Here its uTorrent. In Command field type the executable command which open your application, For example, If you like to have launcher for gedit then in command field type gedit(its already there so you don’t have to do for gedit). For uTorrent I am using the below command in the command field. After filling all the required field, set icon for the application launcher. Just click on the small box on the top left side near name field and chose a image for it. That’s it. Application Launcher is created for your application. By creating application launcher, your making the application available in the Dash search results. Go to the Dash and type the Application name. From the dash result drag your application and drop it in Unity. 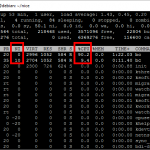 Do you want to know where utorrent download saves the file? How do you delete it if after I have made a mistake of choosing the icon that was not supposed to be? I found the file, but am having trouble deleting it. How do you delete such a file? Same here, found the file, but can’t delete it. Its nothing more than a text file, just open it with gedit and make the changes. hi, thx but i cant get the application working after creating the icon with your command, nothing is happening after i click on it or press open with right click. There’s a line up there I can’t POSSIBLY read: the line about invoke gnome panel. It’s about 0.05 thick. Not only can I not see any letters there, I’m not sure I can see anything BUT THE BOX in there. I’m on chrome…what’s the deal? is it necessary in this case, or do you just prefer to do that? (gnome-desktop-item-edit:14963): IBUS-WARNING **: The owner of /home/user/.config/ibus/bus is not root! This is probably because the application command you’re linking to is in your own home directory. 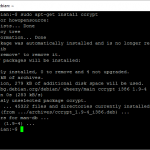 Try to install applications into /usr/bin/app or somewhere appropriate and try again. What’s appropriate, because what you suggested didn’t work. 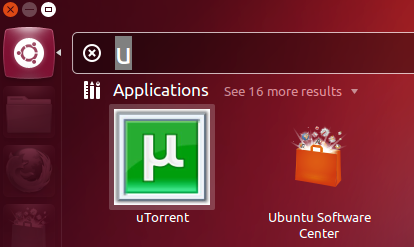 Can you please tell where to get that uTorrent icon?